They decided to replace the food pyramid yesterday. I’m happy they chose a plate. I like pyramids well enough, but I never associated them with food. I only remembered that grains were at the bottom and sweets and fats were at the top. Everythings else was just a jumble. It’s a fork not a spork! Phew! Since one out of every five meals is eaten in the car, maybe they should have considered a bag, a carton, or even a lap with a cup holder… When I plan dinner, I have a visual in my head. I picture a meat/protein, veggies and a grain. Three components only. I don’t usually eat fruit at dinner, but on my way home from work I will chomp on an apple in the car. Maybe that’s my dinner “fruit”? Fruit as a dessert is a wonderful thing too. 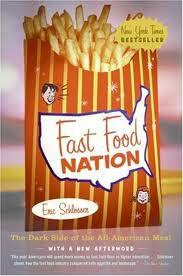 For those of you reading the book, where does fast food fit into the plate? Can we give people a guide like this if they don’t know how to cook? What does this plate graphic mean to the “fast food lover” (or the person who eats fast food 50 times per month)? Q: Fast food chains, despite the myriad problems documented by the author, have an undeniable appeal-they are convenient and offer inexpensive and tasty food. Even if you are disturbed by the practices of these corporations, could you realistically swear off your food, given its ubiquity and mainstream appeal? If you are driving home from work, tired and hungry, and your two choices are a familiar fast food restaurant or an unknown Mom-and-pop, which would you choose? What kinds of implications does this choice have? My answer: It’s really important to remember that everyone is on their own food journey. Just 18 months ago I thought eating school lunch every day was fine. Looking back I think that I was either nuts or naive(definitely both!). My relationship with food as it currently stands would never allow me to do that again. Are you driving home from work tired and hungry? I’m not, but I also pack a decent lunch and snacks for my car (and I carry gum in my purse too). Anyway, I think most people chose fast food in that situation. Many things that bother me about the choice of fast food, but one is that the money doesn’t stay in the community, but is wired directly to the corporation’s headquarters. If you buy from a local Mom and Pop, your money usually stays in your community. Q: Since few people would confuse fast food with health food, who bears the greater responsibility for the alarming rate of obesity in children in the United States: the fast food chains that market “supersize” meals to children, or parents who are not educating their children about the benefits of a balanced diet? Can well-intentioned parents maintain control over the eating habits of their children in an era when school districts are contracting to bring fast food into the school cafeteria? My answer: This is a loaded question, but an important one. Parents make the decisions for their children. But many parents don’t recognize marketing as what it is: an illusion to get you to buy something. And to answer the last question: that’s why we need school lunch reform. I know you have something to say so please comment below! "but one is that the money doesn't stay in the community, but is wired directly to the corporation's headquarters." I don't normally eat fast food and its not the greatest for you, but this statement isn't correct. Most fast food restaurants are owned by local franchisees, who are members of your community. And all those people working there getting a paycheck are also members of your community. Some fast food restaurants also give back to the community – Ronald McDonald house for example is a great resource. Also Mom and Pops could be using their profit (if they have any) to finance who knows what, maybe some political thing you are against. Anyway, I don't think the where your money goes argument is so black and white. Good point – knowing where the money goes is not always black and white. But for every national chain fast food restaurant, you can be sure that a least a portion of profits go to the corporation owner for licencing that franchise, even if it isn't owned by the corporation. Plus, many national fast food chains require their franchises to purchase certain products (for example all of the paperware that has that to be branded) from a non-local source. Many even do this for the food supply as well. Local stores at least have the opportunity to support local businesses. Plus with a "mom and pop" local store, chances are you could actually talk to the owner, and see what causes they support. I love the new food plate. I think it's so easy to understand and implement. Even my five year old gets it. I used it last night when she asked for another piece of cornbread instead of eating her black bean & veggie soup. I reminded her of the plate and she chose to eat her soup instead of having more bread. Success! I think that the food plate is perfect for fast food – most people won't think about the fact that getting a hamburger and fries will over-fill their plate with two helpings of grains. This offers an opportunity to re-think fast food – do I have the whole sandwich without fries, or the patty and veggies with fries? Suddenly the balance of food is spread out by meal, not by day. The new pyramid encourages building meals, and, ultimately, menus and meal plans. Brilliance. Sorry this isn't related to this post, but I saw this and thought you would be interested in it. 1) They may not be suggesting that each meal include 1/4 fruit and 1/4 veggie. It could easily be half a plate of fruit at breakfast, and half a plate of veggies at dinner. 2) Some of the things we commonly think of as veggies are actually fruit: tomatoes, cucumbers and squash are the three that quickly spring to mind. A dinner including roast chicken, brown rice, steamed green beans, and a chopped cucumber salad would be a perfect meal to illustrate this new plan. Orthorexia aside, I always think of The Matrix when I think about the evolution of how I think about food. Once you swallow that pill, you can't un-know what you've learned. I recently went to a local-yokel restaurant, a place I loved as a kid and young adult, and ordered my favorite dish. It was exactly the same as it was in 1975. And I was repulsed. I'm slightly put out by this and annoyed at my taste buds for changing on me. So yes, I'm glad I'm eating better than I was. And the dish I ordered was no good for me so it's just as well that I'm not interested anymore. But it does rob life of some joy. As to the fast food…I take my kids there sometimes. And we talk about what good and bad choices look like. And how sometimes you just want a chicken nugget, and once a month won't kill you but once a week will certainly slow you down as you try to beat the throw to first. And currently my kids will split the orders for sides–one gets fries, one gets apple slices, and they share both, and both are happy (which is hard for me to imagine–when I was their age, an apple was not appealing, but they are glad to share because they really do actually like both), and none of us get soda. It makes it more of a livable compromise for me. And we talk a LOT about the advertising. Not to make this longer than the original post, but I recently bought my kids a cool-looking thing they saw on TV that (of course) wasn't nearly as cool in real life. And it was an excellent lesson in how advertising doesn't necessarily lie, but its job is to make you want to buy things, especially that you don't need. And those lessons, I hope, will serve them well for a long time. First question: yikes, could I swear off all fast food? I mean, I wouldn't want to, but I could if it came down to it. Granted, I'm sure I'd have some struggles while passing chik-fil-a at times, but i'd deal with it. As far as fast food vs. mom-and-pop, I would struggle because I do tend to be pretty suspicious of new food places, even when my other choice is something I don't necessarily agree with from a nutritional standpoint. I'd probably look for a sandwich place as a compromise. Next question: I think fast food restaurants need to take a good portion of the blame, just based on the fact that their advertising has worked for a long time, regardless of their business ethics and nutritional standpoints. It is not only kids who are subjected to the advertisements, adults get sucked in too. While yes, adults are old enough to make their own decisions, there is a huge population of adults who are incredibly uninformed or misinformed. I know childhood obesity is a complicated issue, and ideally, as a nation, we should only examine "fault" in order to come up with solutions, and not dwell too much on blaming. This issue is personal to me because my younger brother is probably considered obese at this point, and has always been overweight. For the most part my parents fed us a balanced diet (looking a lot like that plate actually, haha), and tried countless ways to help my brother thin out, but nothing really worked. Now that he is 21, I just have to hope that he'll be able to ultimately strike a balance since my parents certainly can't mandate his eating and activity now. We don't really eat fast food. We eat at home. I'd much rather try out a mom and pop when we're on the road. This hasn't always been the case. We've weaned off of fast food over the years and now it has no appeal. Makes me feel gross. I believe that parents can only do so much in a toxic food enivornment and it's time for Big Food and the USDA to step up and make more changes. In the meantime, I let my grocery dollars do the talking. I'm not sure that the plate works for people who are going to look at it literally, as Mrs. Q seemed to do. The plate isn't supposed to represent each meal, it is supposed to represent a day's nutrition. If people fill their plate at each meal in this way, they may not be counting in the snacks they eat. If, for example, you eat some crackers and cheese as a morning snack and a yogurt in the afternoon, you wouldn't necessarily need as many grain and dairy products in your breakfast, lunch, and dinner. And I don't know anyone who eats a quarter plate of veggies at breakfast time, but I do try to eat a few servings at mid-morning, when I start thinking about lunch. 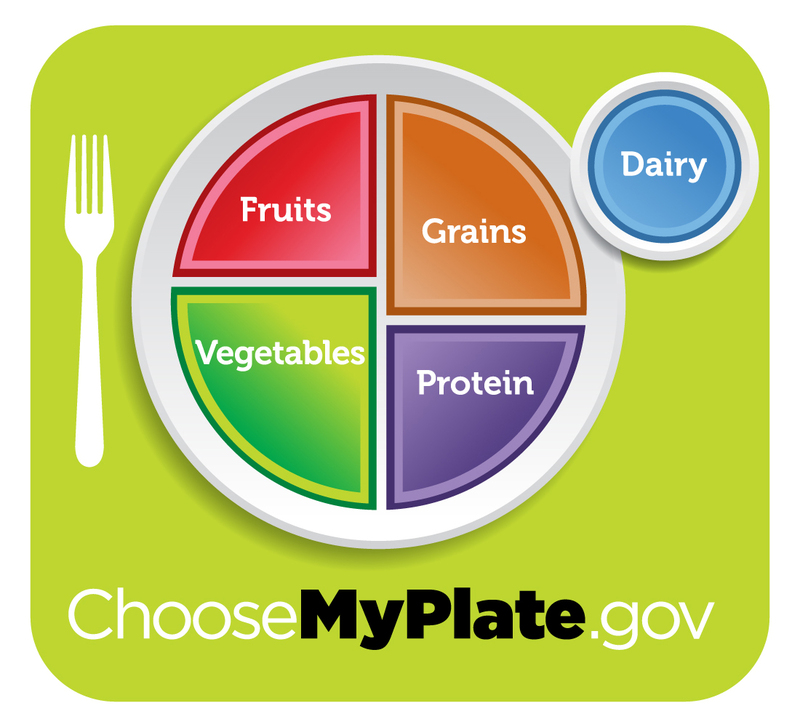 The point is to find the plate's balance of nutrition in the total food you eat for the day. I do believe that creating a new symbol of nutrition guidelines will put nutrition in the headlines for a few days, and that may be the biggest benefit of the change. @Anonymous 9:04am — I think it's really easy to take a plate graphic literally! It does help me think about dinner, but it confuses the other meals (like breakfast as you point out). "….. one out of every five meals is eaten in the car …." That's so sad. Maybe even the saddest fact about our food culture in this country today. I don't like the plate at all. A plate represents a meal, not a daily allowance. I know they want to "simplify" nutrition so that everyone can understand it but I don't think this is the solution. As for fast food, if I HAD to choose, I'd choose the mom-n-pop. We have some wonderful local joints, even if the food isn't the most nutritious. 🙂 You can definitely see that they take more care in what they create and the people tend to be more friendly. For our family, fast food has become a rare treat. A few years ago it was a Friday tradition. Then it became once or twice a month. Now we can go months without eating fast food. Really, it isn't that hard. Q: Since few people would confuse fast food with health food, who bears the greater responsibility for the alarming rate of obesity in children in the United States: the fast food chains that market "supersize" meals to children, or parents who are not educating their children about the benefits of a balanced diet? I think that everyone is responsible. Fast food and marketing definitely play a part. Schools that no longer teach cooking or nutrition play a part. Parents who don't teach their children about proper nutrition play a part. Doctors who aren't helping parents with nutritional information play a part. As it takes a village to raise a child, so it is the village's fault if that child is not raised properly. Unfortunately we have a lot of people who don't know what proper nutrition is and haven't been raised to be healthy adults. The problem becomes compounded with each generation if we don't do something to stop the trend.